(CNN)– Mitt Romney's campaign continued its Medicare blitz against President Barack Obama in a new television ad Wednesday, targeting the president over his sweeping health care reform law. The 30-second spot, "Nothing's Free," blasts the health care law as legislation that would financially harm middle class Americans. "Some think Obamacare is the same as free healthcare," the ad's narrator says. "But nothing is free." The narrator then goes on to claim the president is cutting $716 billion from Medicare, "changing the program forever." 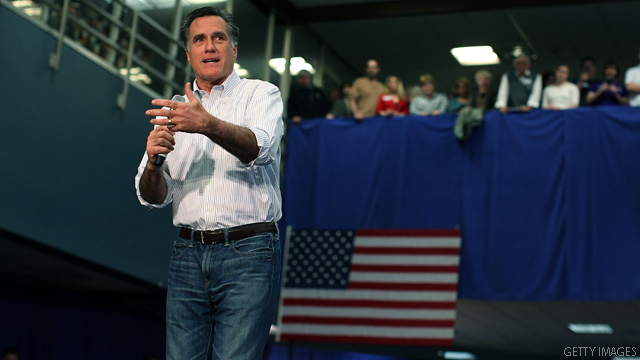 Romney's campaign has repeatedly slung the attack line at Team Obama in recent days, citing a Congressional Budget Office report that says a repeal of the health care law would result in a $716 billion increase in Medicare spending. Obama's campaign, hitting back, argues that the report is referring to billions in savings in health care costs, not cuts. And the report stipulates that a repeal of the health care law does not signal a $716 billion decrease if the measure stays in place – which is Romney's argument. In response to the ad, Obama campaign spokeswoman Lis Smith said in a statement, "While providing tax credits to help families and small businesses afford health care, Obamacare extended the life of Medicare by nearly a decade, strengthened Medicare benefits, and achieved $716 billion in savings by cracking down on fraud and needless payments to insurance companies." Wednesday's ad marks the fourth commercial the Romney campaign has released on Medicare in the last 10 days. It also claims the health care law, recently upheld by the Supreme Court, would raise taxes on "wheelchairs and pacemakers," referring to the excise tax on medical devices. Earlier this year, House Republicans passed a bill to try to remove the medical device tax from the legislation, but the bill did not make it through the Democratic-controlled Senate. "Free healthcare comes at a very high price," the narrator says, before pivoting to Romney's health care plan. "The Romney-Ryan plan will restore Medicare funding and protect and strengthen the program for the next generation." Romney and his running mate, Paul Ryan, have said they support a Medicare plan that would give seniors credit to purchase their own health care insurance. A Pew Research Center poll released Tuesday, however, indicates such a proposal is unpopular among Americans, as 49% said they oppose such an idea. The Obama campaign also rebutted Romney's Medicare claims in its own ad released last week, pointing to the AARP. "The non-partisan AARP says Obamacare 'cracks down on Medicare fraud, waste, and abuse,' and strengthens guaranteed benefits," the Obama ad said. And Smith, in her statement said, "Mitt Romney's newest ad is right about one thing: nothing's free, especially the Romney-Ryan plan to turn Medicare into a voucher system." "The Romney-Ryan plan would end the Medicare guarantee and raise costs by up to $6,400 for seniors," she continued. "Under their plan, seniors would face higher Medicare premiums and prescription drug costs, and would be forced to pay out of pocket for preventive care. And their plan would give $150 billion taxpayer dollars back to private insurance companies and allow waste and fraud back into the Medicare system, raising costs for everyone." there really needs to be a LAW against LYING to the public. this 716 billion more in costs if you repeal the healthcare law tells me that we are SAVING 716 billion that we would be paying if the healthcare law was NOT passed. If you live in a battle ground state, like I do your probably tired of all the ads. There is nothing a republican can ever say to make me vote for them. Not one jobs bill have they even considered. Not one. Team Obama doesn't seem to understand much about Medicare. 1) The AARP has lost credibility with the vast majority of seniors and 2) The younger generations understand Medicare will not be there for them in future 3) Most Americans see through his empty rhetoric not only in this issue but others.